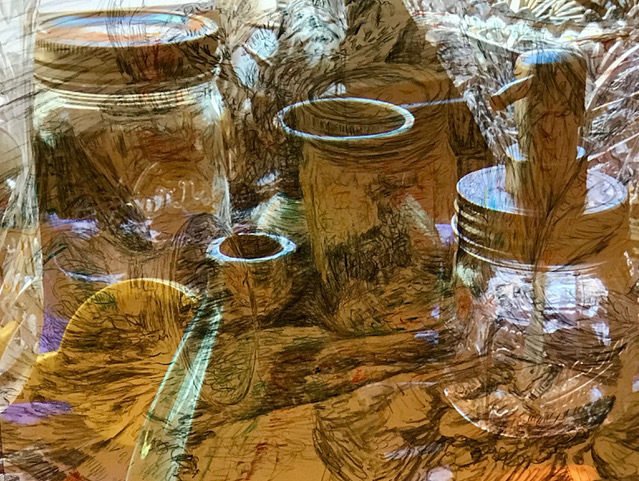 Diane Richey-Ward is a mixed media visual artist based in northern California who combines large scale charcoal and pastel drawings with photo imagery and video in a unique blend of abstraction and realism. 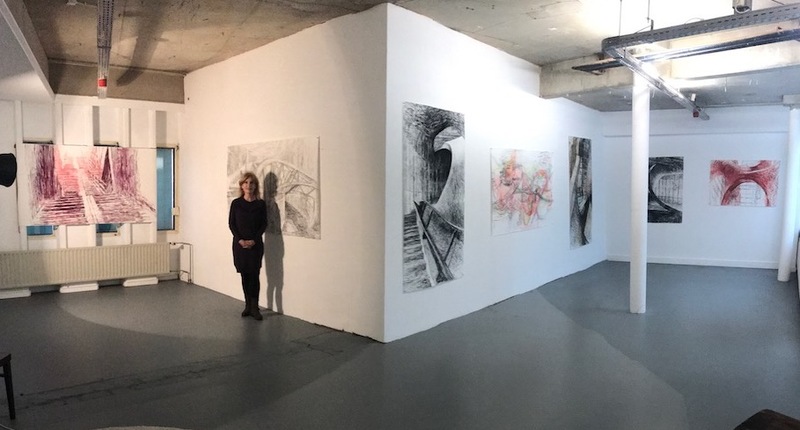 This allows her to “investigate notions of movement and space within a particular nomadic narration.” She has exhibited her work near and far in such places as Costa Rica, Canada, France, Spain, Portugal and Holland. She was awarded a 3 month fellowship with the Swatch Art Residency in Shanghai - the same one attended by my previously interviewed artist Alec Von Bargen, whom Diane met while they were both in residence. Great to connect again! We have been to a few of the same residencies - in Portugal and Mexico - though not at the same time, unfortunately! Tell us more about how you have combined art and travel in your life and work! Thanks, Amy. It gives me an opportunity to think about these important issues and try to grasp how I feel about them. Why are you called to make art and how does travel connect the dots for you? I’ve been taking photographs furiously since about 10 years old- and dreamed of being a photojournalist someday when I was a teenager so that I could see the world! But after completing my degree in art at Cal State East Bay, I decided fine art was my true passion. It wasn’t until years later, after my two daughters were in elementary school, that was I able to finish my MA at Sac State and work full-time as an artist. I really just have an insatiable need for new stimulation, and traveling as much as I can seems to work well with the evolution of my artwork and my general well-being! Diane at work on a charcoal drawing in Lisbon. Can you tell us more about the work you do and what techniques you use to create? For the past 3 years, I have been integrating drawing into an expanded practice: combining photographic elements with the naked mark of charcoal and pastel. By layering elements of mechanical and natural forms, in both transparent photographic layers and drawn images, I search for dynamic formal configurations. This process seems to allow me to tap into a level of investigation where entirely new form presents itself. As the photographer Diane Arbus once said, “It’s what I’ve never seen before that I recognize”. The process itself is a bit unusual: I take a photo of a projected image overlaying a large-scale drawing. 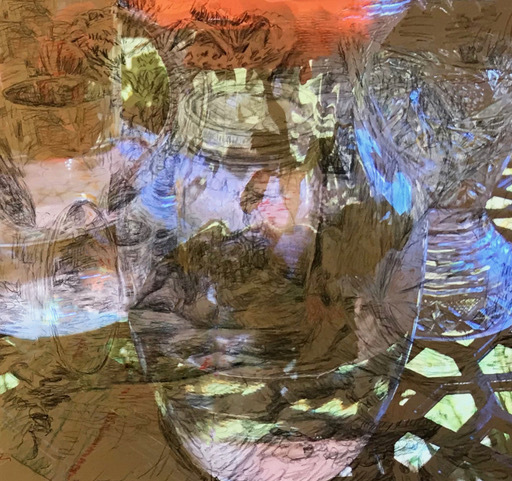 The resulting layered image is exhibited as an archival digital print. As a professional artist - how do you juggle family, money and travel and other considerations? It’s quite a challenge to be able to afford art residencies and travel. I realized early on that I should use only one credit card and accumulate as many miles as possible to be able to fly for free. Second- it takes more research to find the free or cheap residencies, and they’re of course much more competitive. But if I save and budget my money most of the year- I can find a way to make travel my priority. It was much more difficult to juggle the family with art residencies, but I actually didn’t start traveling and working until they were teenagers and about ready to head to college. How do you travel with your medium - do you always work large scale - do you make the art on the road or when you get home? And what supplies do you bring with you? Over the years the drawing paper I bring in a big tube keeps getting larger, which makes it a bit more difficult to travel with. But I find that checking the tube as an oversize piece of luggage is the easiest way to go. If it turns out that I’m traveling after the art-making portion of trip, I’ll ship the tube home so I won’t have to carry it around. I bring a container of pastels, charcoal, lots of erasers, razor blade and tape to put up the paper if the wall won’t take the push pins I usually use. You have to buy the fixative spray at your destination because you can’t have it in your luggage, and it’s usually my first task to find an art supply store. How did you first hear about artist residencies? My friend, Sandy Parris, attended an art residency 25 years ago at the Montalvo Center near San Jose and she loved the experience. It seemed like a perfect way to work, undistracted by family pressures, and yet be able to meet other artists and patrons. Tell us about some of the residencies you’ve been to and why you chose those particular places. I usually choose residencies according to a few important criteria: 1) desirable location, 2)support for the production/exhibition of my work, 3)privacy and comfort of accommodations. I’m used to sharing kitchens and sometimes a bathroom, but I prefer to have a private, and hopefully spacious studio. Over 23 years, I’ve had many varied experiences…but my favorite was the Shanghai Swatch Art Peace Hotel. The friends I met there, in addition to the high level of support and accommodations were incredible. 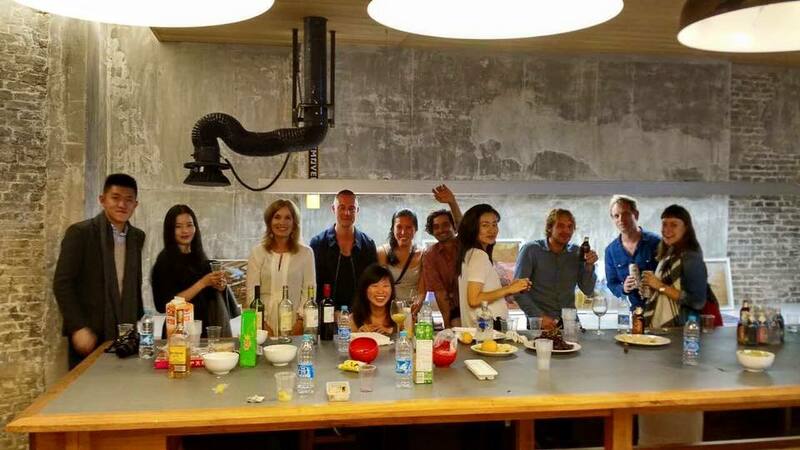 Diane with fellow artists at the closing reception at the Swatch Art Peace Hotel Residency, Shanghai, 2015. Is your work directly related to the environments you go to and how? Or do you continue to work on projects already in motion? About 3 years ago I became quite interested in the geometric structure of architectural form, where I developed a new body of work in Shanghai, China in 2015 and Valencia, Spain in 2016, both locations selected for the strong contemporary architecture present. In Valencia, for example- the “Ciudad des Artes y Siencias” by Santiago Calatrava, were quite inspirational for the evolution of my work in terms of form and imagination. About 6 months before leaving for Shanghai, I began researching and drawing the contemporary architecture I found online, which really helped my progress after arriving at the residency. Other times I’ve started a brand new series at the beginning of a residency, especially if it’s at least 2 months long, which is a good period of time to begin to develop a project. What kind of projects have you applied to residencies with? Often my projects involve photographing the local architecture or farming machinery- to be used as a springboard for seeking new form.I’ve also applied a few times proposing a video and drawing installation. In 2016 the Valencia architecture project involved projecting slow-motion videos of an amusement park over drawings of abstractions of architectural form. Do you keep a travel journal when you are on the road? My travel journals are basically photographic rather than verbal. I take pictures of anything and everything that interests me that I feel I could use:either as an inspiration, a documentation or as an actual accompaniment to a drawing as part of a work of art. What do you think are the best and worst things about residencies and do you have any highs and lows you want to share with us? The best thing about residencies are easy to identify: being able to work without distractions, and being stimulated by living in a different environment and meeting other artists. So many things can go wrong with residencies, that the list can be long: I guess the worst scenario is an overbearing host or hostess, who is micromanaging everything you do while a guest at their residency. (This happened about 4 years ago and almost stopped me from ever going to another one, but it was more complicated than that: this same host was somewhat of a mean tyrant!) The other, more frequent pitfalls are the accommodations themselves that can be an issue: too small of space to work, loud neighbors, unruly co-artists with issues, and my favorite: machines that don’t work! So many times the oven or toilet is broken or the bathtub doesn’t drain after your roommate left it. Yikes! What advice would you give to others wanting to explore the life of the artist/traveler? Take the time to research residency websites carefully. There are 3 or 4 comprehensive residency websites, www.transartists.nl is probably the largest site. Before taking the time to apply for the residency, make sure you’ve read all the requirements/restrictions, qualifications. This can be exhausting- but some websites like www.resartis.org have a screening tool which does cut down on the sheer number of places to apply for. It’s important to Plan Ahead! Often the best residencies need to be applied for at least a year in advance. That year goes by quickly and will give you time to plan what it is you’re going to be working on, and to then begin work on the series you applied with ahead of your arrival. Then you kind of hit the ground running when you get to your destination. Since there is alway an adjustment period in any new locale- to get a feel for the neighborhood, the house itself, possible new roommates, etc. For me it takes about 4-5 days to feel at home, become acquainted with the surroundings and to relax enough to get down to work. If attending a formal art residency isn’t a good fit, an artist can always rent a place that has a room or studio to do artwork, but I’ve found that this is much harder to find than it would seem! People renting homes and apartments internationally are not crazy about renting to a working artist. But if you search art websites online for “artist’s studios to rent” in whatever city you’d like to visit, you may be able to find something. The advantage is that there will be no expectations by anyone to “perform” artistically (as with some residencies), but the disadvantage is that you won’t have the guidance, community and artistic support by an organized residency. I wanted to say that probably the most difficult task in traveling and working on artwork in different locales is finding a balance between SEEING NEW THINGS and MAKING NEW THINGS. It’s quite tempting to spend most of your time enjoying all the new stimulation around you, but then you realize you also selected this particular place to make new work, too. The way this works best for me is to utilize my natural work rhythms: I work better in the mornings to mid-late afternoon, and my reward for working hard is to take off and explore the city afterwards. It just takes a bit of practice to travel and work on the same trip, but once you get the hang of it you don’t want to do anything else!